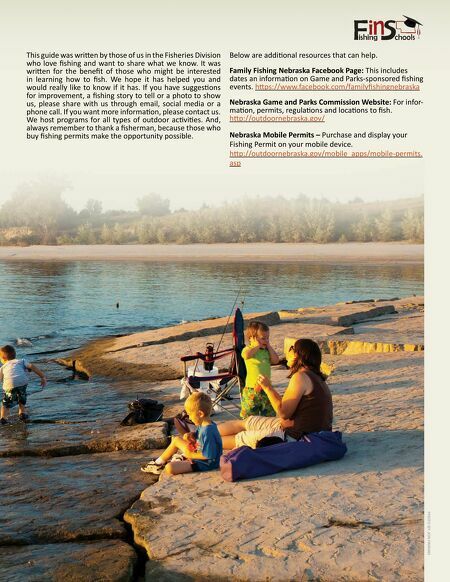 Access digital copies of guides and regulations publications from the Nebraska Game and Parks Commission. LET'S GO FISHING You can worry about work, school, chores, laundry, grass mowing or anything else later! The memory you will have of today's fi shing trip will last the rest of your life. You will forget that you folded laundry by the end of the week. It's simple! Here's what you do. Find a friend (child, wife, husband, parent) and tell them you will pick them up in 15 minutes. Go to the refrigerator and pack a soda, sandwich and snack for each of you and perhaps some canned corn or hot dogs for bait. Before leaving the house, grab a camera, sunscreen, a book and a Frisbee. From the garage, get lawn chairs, fi shing poles and your tackle box. 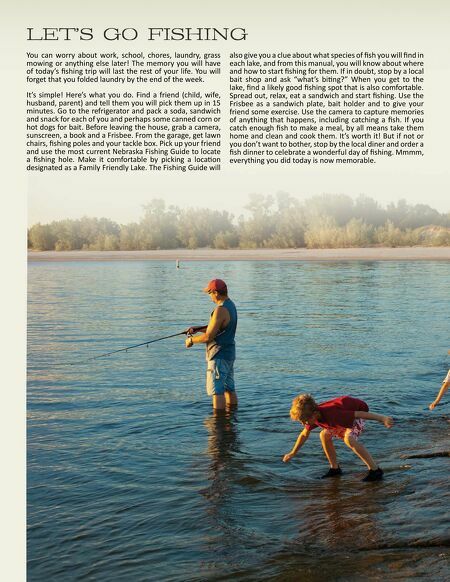 Pick up your friend and use the most current Nebraska Fishing Guide to locate a fi shing hole. Make it comfortable by picking a locaƟ on designated as a Family Friendly Lake. The Fishing Guide will also give you a clue about what species of fi sh you will fi nd in each lake, and from this manual, you will know about where and how to start fi shing for them. If in doubt, stop by a local bait shop and ask "what's biƟ ng?" When you get to the lake, fi nd a likely good fi shing spot that is also comfortable. Spread out, relax, eat a sandwich and start fi shing. Use the Frisbee as a sandwich plate, bait holder and to give your friend some exercise. Use the camera to capture memories of anything that happens, including catching a fi sh. If you catch enough fi sh to make a meal, by all means take them home and clean and cook them. It's worth it! But if not or you don't want to bother, stop by the local diner and order a fi sh dinner to celebrate a wonderful day of fi shing. Mmmm, everything you did today is now memorable.